The advancements in technology have now begin to take a foothold with toothbrush design as well. Electric toothbrushes are becoming more and more cutting-edge, offering a greater number of features than ever before. At the forefront of this breakthroughs is Oral-B, providing some of the best electric toothbrushes available. The Oral-B Pro 5000 comes with several components to complete its ensemble. First off is the SmartSeries handle which is where the majority of the hi-tech functions are situated. Accompanying the handle is the patented CrossAction brush head. There is also a charging station with places to place other brush heads. And finally a travel case that securely fits the various pieces of the electric toothbrush to ensure safe travel. One of the first things up for discussion with the Pro 5000 is the brush head. After all, it is one of the more basic yet important components of a toothbrush. Oral-B has stuck with its tried and true design with the CrossAction brush head. It is recognizable due its multi-cultured bristles that are uniquely positioned on a circular brush head. The design of this is quite crucial as it is one of the reasons that the Pro 5000 is so effective at removing plaque. The shape and construct of the brush head allows all areas of the tooth to be accessed, even the spaces between the teeth. This means that your brushing experience is more well-rounded than usual. The brush head also pulses and rotates to make sure that each tooth is well cleaned. It is estimated that the Oral-B Pro 500 removes hundred percent more plaque than non-electric models. Lower down on the toothbrush are the buttons – one to power the toothbrush, the other to choose between the modes. With the Pro 5000, you can choose from five different modes, depending on what type of oral care you require. With these, you are able to clean your teeth in a manner which is best suited to your current dental situation. Therefore, you are able to customize how you are able to brush your teeth. These options cater to those with regular oral health, require more sensitive care, or who are looking for an incredibly inclusive experience. The Pro 5000 is also equipped with a timer. It is set for a duration of two minutes, which has been determined to be the best possible brushing period. Once this time is up, you will be alerted. Once you have started brushing your teeth, the handle will vibrate every thirty seconds. This is the signal that you should switch to a different part of your mouth. The other impressive feature on the Pro 5000 is the pressure sensor. This is a sensor that monitors the amount of pressure that you apply as you brush your teeth. This is in place to make certain that you are not over brushing your teeth. If there is an indication that you are using too much pressure, the handle will flash red, signifying that you should reduce the force. 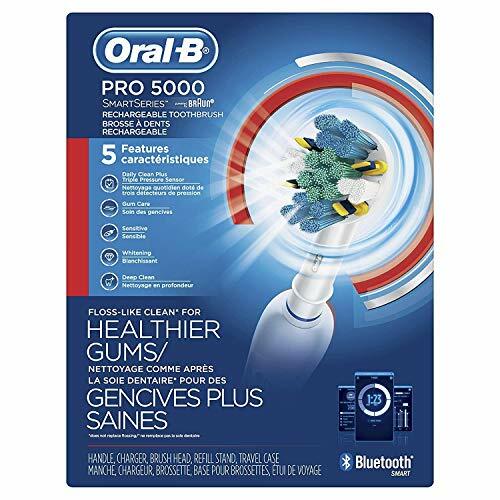 Compared to earlier models or different brands, one of the things that sets the Pro 5000 apart is the Bluetooth feature and the Oral-B app, (itunes) & (playstore). The app can be downloaded on most commonly used smartphones. With this, you are able to connect to the toothbrush. This is great for those who want to know what is going on as they brush their teeth and how they can improve the experience. Every time that you brush your teeth and use the app, there is information being logged. You will be able to take stock of your brushing over the period of six months. You can also customize the amount of time that you want to spend on each part of your mouth. This is useful for those who have received special instructions from their dentist. What these features really provide you with, however, is a more interactive experience than you previously had. Instead of flying blind, you are able to receive useful and comprehensive information about brushing your technique. This certainly can reduce the number of dental issues that you have later on. At the very least, it does offer up a level of fun and motivation that may be lacking in other electric or manual toothbrushes. Battery life is not great – can average about a week before needing charging. This is much lower than other competing brands. In the end, it all boils down to whether or not the Oral-B Pro 5000 is worth your money. If you are looking to make a switch from manual toothbrushes, the answer is a resounding yes! This is because it has been proven that you will be receiving much better care from your Pro 500 toothbrush than before. The toothbrush will be doing a much more effective job of cleaning your teeth and removing plaque. It also offers up a variety of solutions for different types of teeth or gum problems. You will also not have to worry about over brushing either as the pressure and time sensors will take care of it for you. The Pro 5000 will be a great option for anybody who cares about their teeth or oral health. In particular, however, individuals who have previously had issues with their dental conditions may find that the Pro 5000 is a great entryway into the world of electric toothbrushes. While it cannot measure up to the newer Oral-B models, it offers up excellent services nonetheless.